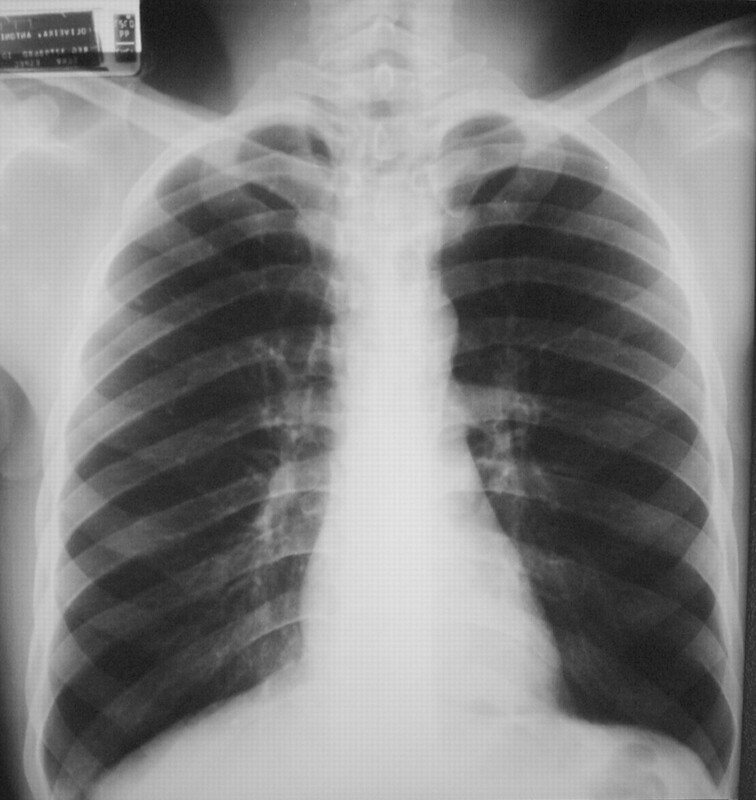 A 26‐yr-old male patient was referred to the outpatient clinic with a history of recurrent respiratory infections since 8 yrs of age and a daily productive cough with purulent sputum. He related nasal sneezing, hoarseness and wheezing episodes to weather changes and exposure to dusts andchemicals. Dyspnoea on exertion was present during exacerbations. He had never smoked and denied any family history of respiratory disease. Physical examination was unremarkable. A chest radiograph (figs 1⇓ and 2⇓) and later a high-resolution computed tomography (HRCT) of the chest (figs 3⇓ and 4⇓) were ordered. Pulmonary function tests showed a forced vital capacity (FVC) of 3.16 L (66% of predicted), a forced expiratory volume in one second (FEV1) of 2.21 L (55% pred), a FEV1/FVC of 0.70 (83% pred) and a forced mid‐expiratory flow of 1.51 (33% pred). There was no response to bronchodilator. High-resolution computed tomography of the chest. BEFORE TURNING THE PAGE, INTERPRET THE RADIOGRAPHS AND HISTORY AND SUGGEST A PROBABLE DIAGNOSIS. 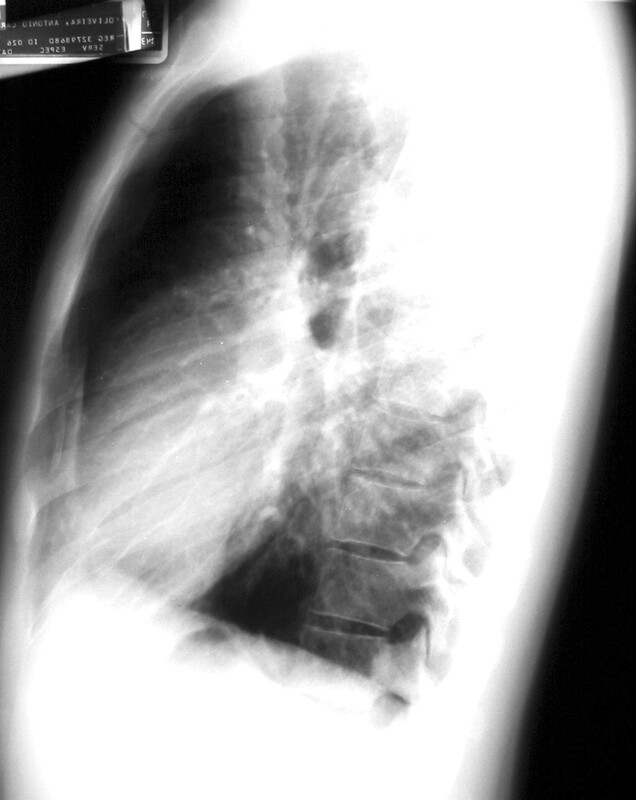 The chest radiograph reveals widening of the trachea and main stem bronchi, best seen at the lateral film. 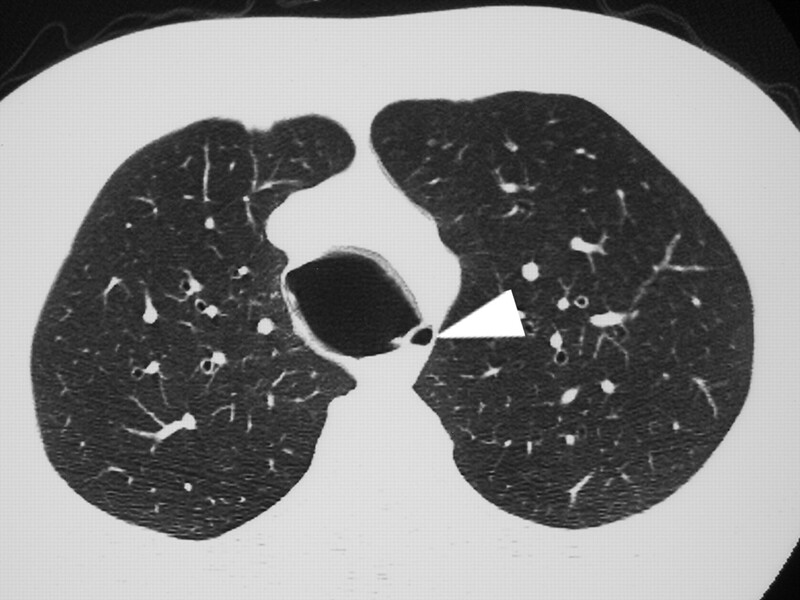 HRCT scan reveals a markedly enlarged trachea and main stem bronchi (trachea 3.5×3.0 cm; right main bronchus 3.0×3.0 cm; left main bronchus 2.5×2.0 cm) with a diverticulum in the distal third of the trachea. Pulmonary function tests reveal a moderate obstructive pattern with no response to bronchodilator. The enlarged trachea and main bronchi are highlighted infigure 5⇓ by arrowheads and arrows, respectively. The diverticulum is highlighted by an arrowhead in figure 6⇓. Arrowheads show the enlarged trachea and arrows show the left and right main bronchi (upper and lower arrows, respectively). a) Postero-anterior view and b) lateral view. Arrowhead shows the tracheal diverticulum. 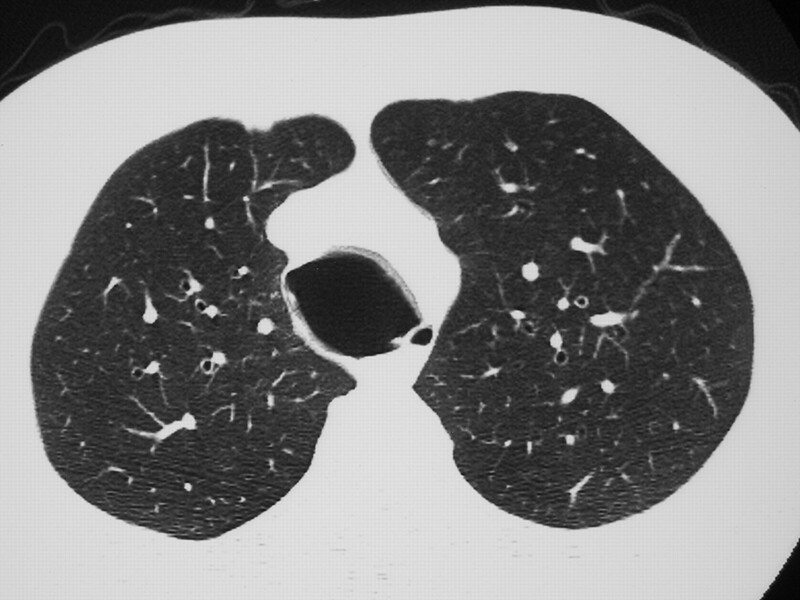 The patient was referred to long‐term pulmonary physical therapy. He received three courses of antibiotics to treat exacerbations in the last 24 months. Tracheobronchomegaly is a rare disease first described by Mounier-Kuhn 1 in 1932. It is characterised by marked tracheobronchial dilatation and recurrent lower respiratory tract infections. The aetiology is unknown, but a decrease of elastic and muscle tissue of the trachea and main bronchi have been reported. As a result, some patients may develop mucosal herniations through the tracheal rings, leading to tracheal diverticulosis. 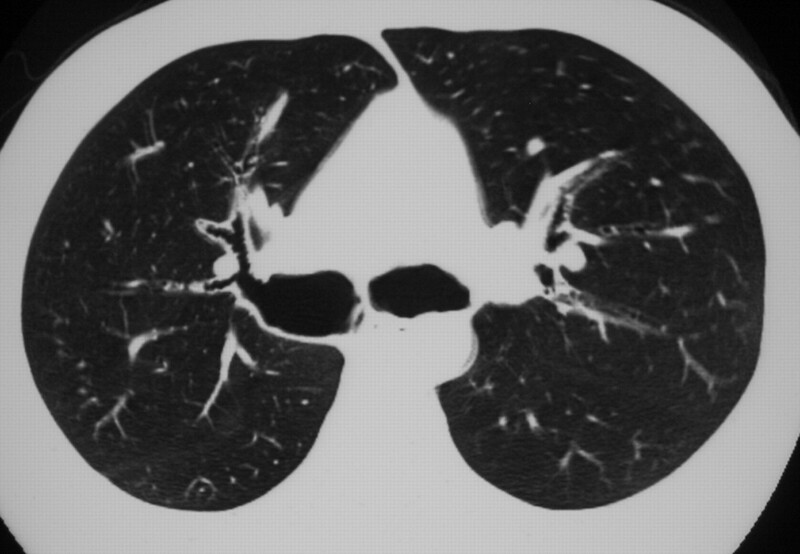 Bronchiectasis is also a common feature of the syndrome 1–5. The syndrome is slightly more common in males, usually in their third and fourth decades of life, although some cases have been reported in ages ranging from 18 months to 76 yrs 3–5. Patients with tracheobronchomegaly may have few or no symptoms without any evidence of disease progression. However, some may have symptoms that are largely indistinguishable from bronchiectasis and chronic bronchitis: productive cough, copious purulent sputum, occasional haemoptysis andprogressive dyspnoea, leading to respiratory failure as thelungs become progressively more damaged. Other possible complications include pneumonia, spontaneous pneumothorax, massive haemoptysis and finger clubbing 4. The increased diameter of the trachea can usually be detected by the chest radiograph, although it can be missed if not looked for. Himalstein and Gallagher 2 performed an autopsy study in which the diameters of trachea and main stem bronchi of 100 males with no tracheobronchial abnormality were measured. Based on this study, tracheobronchomegaly may be diagnosed when the diameters of the trachea and right and left main bronchus exceeds 3.0 cm, 2.4 cm and 2.3 cm, respectively. This can be best measured by HRCT. Pulmonary function tests may reveal an obstructive pattern with increased residual volume and total lung capacity. No specific therapy is indicated for asymptomatic patients with tracheobronchomegaly. Smoking cessation advice must be provided. Treatment is limited to intensive antimicrobial therapy during acute exacerbations, physical therapy and postural drainage to assist in clearing secretions. Surgery has no value due to the diffuse nature of the disease. The use of traqueobronchial prosthesis (e.g. UltraFlex prosthesis; Boston Scientific, Boston, MA, USA) has been reported with good results and may have a role in advanced cases 6. Mounier-Kunh syndrome should always be suspected in a patient with recurrent respiratory infections and chronic sputum production. A careful analysis of the central airways at the chest radiograph of these patients is obligatory. Mounier-Kuhn P. Dilatation de la trachee: constatations radiographiques et bronchoscopiques. [Tracheal diatation: radiography and bronchoscopy findings]. Lyon Med 1932;150:106–109. Himalstein MR, Gallagher JC. Tracheobronchomegaly. Ann Otol Rhinol Laryngol 1973;82:223–227. Lazzarini‐de‐Oliveira LC, Costa de Barros Franco CA, Gomes de Salles CL, de Oliveira AC. Chest 2001;120:1018–1020. Schwartz M, Rossoff L. Tracheobronchomegaly. Chest 1994;106:1589–1590. Van Schoor J, Joos G, Pauwels R. Tracheobronchomegaly ‐ the Mounier‐Kuhn syndrome: report of two cases and review of the literature. Eur Respir J 1991;4:1303–1306. Barakat J, Belleguic C, Le Garff G, et al. Treatment of tracheobronchomegaly with an Ultraflex prosthesis. A case report. Rev Pneumol Clin 2002;58:19–22.